Hi my fellow foreigners, it’s been another month at English Harmony and here I am again to deliver another monthly highlights report to those of you who didn’t get a chance or were too busy to read my blog posts regularly. First of all, I’d like to tell you about a motivational poster I created on the New Year’s Day. Many of my mailing list subscribers and blog visitors have already printed it out and stuck it up on the wall, and you’re welcome to do the same. Just Click HERE to Open the Poster, and a large format image is going to open up so that you can conveniently send it to your printer. The poster consists of the main premises of the English Harmony project such as – “Focus on what you CAN say instead what you CAN’T” and “Don’t mind your mistakes. Even native English speakers make plenty of them!” and many more; and the whole point of having the poster printed out is to keep yourself motivated to improve and maintain your English fluency throughout this year. As you might have noticed, my approach towards English improvement is a bit different than you’d see elsewhere. I don’t preach grammar perfection and I don’t promote sophistication when it comes to speaking in English. 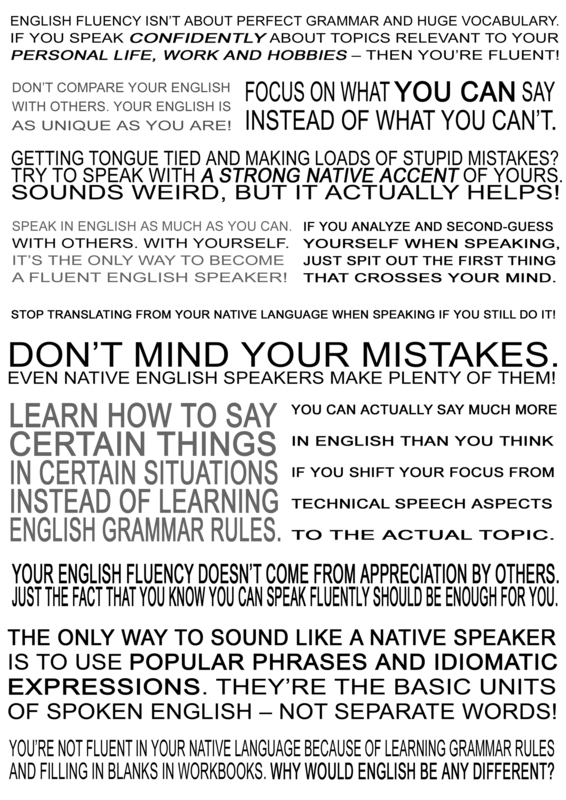 Basically what I’m saying is – stop giving yourself a hard time, have an open mind and you’ll stand a much bigger chance to succeed as a foreign English speaker, and this poster is the essence of my English fluency philosophy. A very important part of the whole English fluency improvement thing is acceptance of your mistakes made when speaking with others, and I want you to read this blog post to understand better what I mean by that. In this article I’m sharing quite a funny yet very embarrassing personal experience with you, and I’m sure you’ll remember similar situations having happened to you in the past. This particular blog post adds to the traditional storyline of us, foreigners, making mistakes while speaking in English by highlighting the fact that even native English speakers can experience moments of confusion and inability to speak properly. As you can imagine, the whole point of this article is to make you realize that you’re not unique, and that such situations aren’t limited to foreign English speakers only. It can happen to anyone, and the key in dealing with such embarrassing moments is in accepting them as part of our lives, and moving on instead of getting stuck in the moment and re-living the shameful experience all over again. On a more entertaining note, I want you to read an article I wrote about one of my favorite TV shows – Mythbusters. Personally I don’t miss any new episodes when they’re released on the Discovery Channel, and in case you’re not a big fan of theirs, I want you to read this article and find out for yourself why watching Mythbusters is not only great fun, but also a way of passive English immersion and improving your English! The five Mythbusters – Jamie, Adam, Tory, Grant and Kari – are covering a wide range of topics on their show and testing different widespread beliefs to see if they hold true, and it’s all done using quite a simple and easy to understand language so that the average foreign English speaker will find it fairly easy to enjoy the program without much difficulty. You see, if you’ve followed my blog for some time, you’ll know that I’m in favor of enjoying life through the English language rather than using conventional language learning methods. Speaking as much as possible with others and with yourself, using English to enjoy your hobbies and also spending your free time doing things that involve the English language will be very beneficial to you as a foreign English speaker, and here’s another example – reading English newspapers. When I just came over to Ireland 10 years ago, I made it my habit to read a newspaper every morning and build my English vocabulary, and it’s a decision I’ve never lived to regret. Phrasal verbs, expressions and simple English language used in tabloid newspapers is what you need to communicate effectively with people at work and on the street. On top of that, you’ll keep up-to-date on current affairs and other news which will serve you as source of conversation starter topics – in case you ever run out of things to talk about with your English speaking friends or if you don’t know how to start a conversation. Making small-talk and discussing simple topics actually is often problematic to many foreign English speakers, because real life conversations require you to be able to improvise and produce speech instantly. It’s something that I was struggling for a long time, and it took me years to realize that speaking is a completely different process from writing. You see, when you write, you can carefully pick the best fitting words, choose the most appropriate English Grammar Tenses and construct nice English sentences. When we speak, we can’t do it because we simply haven’t got time for it, so it’s hardly surprising that our English writing is much better that speech. If you’ve been wandering the same thing please read this article I wrote in the beginning of January – it will shed light on the issue and give you a piece of mind in case it’s been troubling you lately. The last blog post I want you to look at today is about how I use every available moment to practice my spoken English, and you can do the very same to get your English going. It’s called “How to improve spoken English while entering sales orders on a PC” and it’s yet another article dedicated to the topic of speaking English with yourself. It’s how I keep myself immersed in the English language for long periods of time during the day, and you can do the same to drastically improve your English fluency! These were the English Harmony Blog highlights of January 2012, and I hope you’ll find at least a few of my articles worth reading! I also hope that you’ll gain something for your own English fluency improvement in the process, and you’re welcome to post your feedback in the comments below! hey!!!! Robby, u r doing nice job and i appreciate your efforts in helping people like us. most importantly, the way u made us to understand the usage of english grammar in spocken language its wonderfull. keep it up!! !Â ThanksÂ a lot.